A great deal of thought can go into making what might appear to be a simple wooden box. The collection of ideas in the image above were gathered from my students at the beginning of a weekend class with the Woodworkers of Western Ohio. You can click on the image for a larger view. I often ask my students to go through this exercise with me. 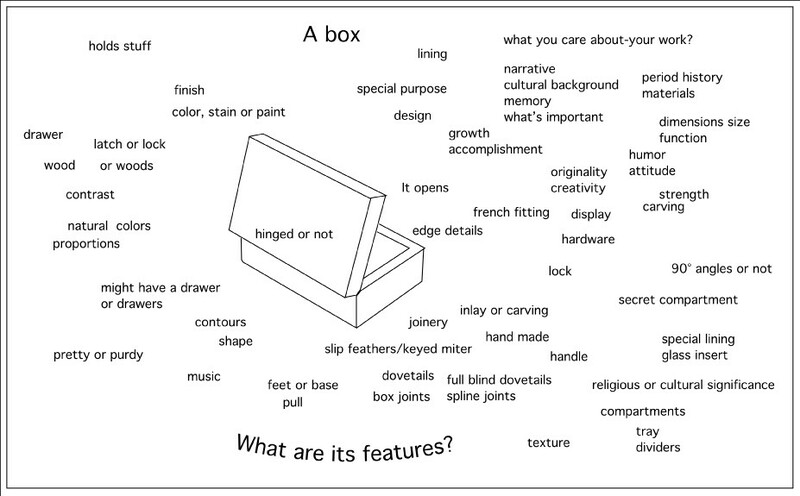 I start with a simple box drawn on the blackboard, and ask my students to describe its features. It may be carved or inlaid. It may have this kind of lid or another. It may have one kind of simple joints or use far more complex joinery techniques. For me, this exercise helps me to break the ice and get students thinking about design. It also tells me the things my students are wanting to learn. 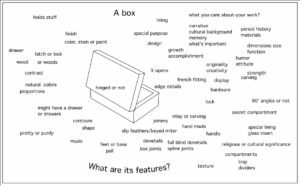 A third point is that it helps my students to see the wide range of options they have in making their own boxes expressive and unique. If you'd like to subscribe to my blog go here and sign up!